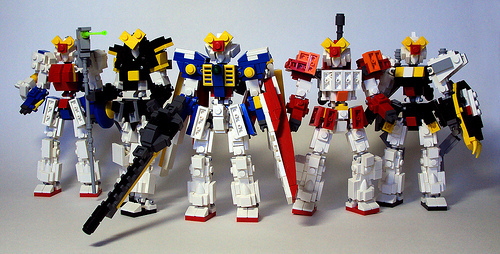 Mike Szita (OrangeKnight Studios) has been building a series of microscale mecha from the Gundam universe over the last while, and he’s just posted a group shot of the squadron that shows off their variety. Don’t forget to check out the Set featuring Detail Pics of the functions and mechanisms unique to each one like Shenlong’s Dragon Fang or Heavy Arms Chest Gatlers. These are wonderful. I’m also happy that they can be (more or less) built in LDD (my personal collection of bricks is small, and mostly in use for other projects). I was so inspired by the techniques used in your models that I have begun work on a Gundam Exia model at the same scale. Actually these were FULLY designed in LDD Universe Mode prior to me ordering all the bricks via BrickLink. Check out the Set(http://www.flickr.com/photos/ok_studios/sets/72157626601772023/) to see some of the earlier WIPs I posted.